"Kid Amazo" - Part 2: "Man & Superman!" The Justice League continues to monitor Frank Halloran, the son of Amazo and argue about what, if anything, they should do about him. At the same time Dr. Ivo and Amazo also discuss Frank's future. Amazo decides that he is going to take matters into his own hands and force the boy to come to their way of thinking. Sometime later Amazo ambushes Frank while the confused young cyborg waits for his girlfriend outside of a movie theater. 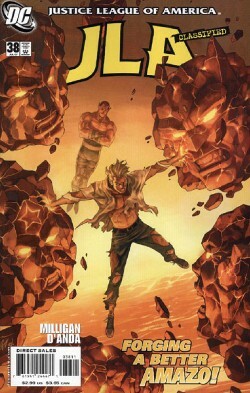 Amazo manipulates Frank into going underground with him where Frank attacks his father. When they reach topside again Frank realizes what Amazo has done and uses his newfound powers to stop the earthquake the two had caused. Afterwards the Justice League convenes again to talk about Halloran. J'onn briefs the group on Halloran's actions, which include him using the seclusion of the Mojave Desert to test his abilities. In the final assessment J'onn feels that given the scans he had performed on Frank's mind the young cyborg is on the verge of insanity. Story - 4: This was a well written issue and the story moved forward at a good clip. Peter Milligan continues to give us an interesting and thought provoking tale that explores the themes of nature versus nurture, destiny versus free will and the relationships between fathers and sons. I'm enjoying this story arc, which now makes for three in a row on this series that have gotten me going as a reader. At the same time this issue didn't have the punch and excitement of the previous chapter. I still like the story, but somehow this chapter, while action packed with great dialogue, didn't seem to have the same oomph as the previous one. It could be that I set myself up for this. I've done that before. The first issue or chapter is so good and I get all excited and then the second issue or chapter comes out and I have such high expectations that nothing the writer does seems good enough. I mean this isn't like when I went to see the second MATRIX film, because that was a genuine let down. More often than not if I feel like something isn't as good as I think it should be the fault rests squarely on my shoulders. I mean the scenes with the Justice League were interesting and humorous with neat little character moments that reminded me why I like the team. Frank's story continues to unfold and I really feel what he is going through and relate, on a certain level, to the problems he's facing. I may not be a cyborg but I know a thing or two about having father/son issues. I never slugged it out with my Dad deep beneath the Earth, but I think this is one of those super-hero tales as an allegory type of deals. So the writing was great. I just have to get over my own preconceived notions and enjoy the darn thing. Art - 4: Like last month the art work highlighted the emotional nature of the story. Carlos draws a great action scene (and drawing an underground fight has to be maddening) but it is the facial expressions and body language of the characters that impress me the most. The panel where Amazo was supposedly hurt by his son's harsh words worked as well as it did because of the artwork. So while I do like his take on the Justice League, especially J'onn, it is the little nuances he puts into his work that make it so compelling. Cover Art - 5: Funky. Very funky. Sami Basri produced a cover that accurately reflects, in a surreal sort of way, the pain and pressure Frank is feeling. The stone faces of the Justice League surround him while his father stares at him from a distance. I enjoy covers like this. They make you think and look fantastic at the same time, which is a hard trick to pull off. Basri succeeds and the book was the better for it.